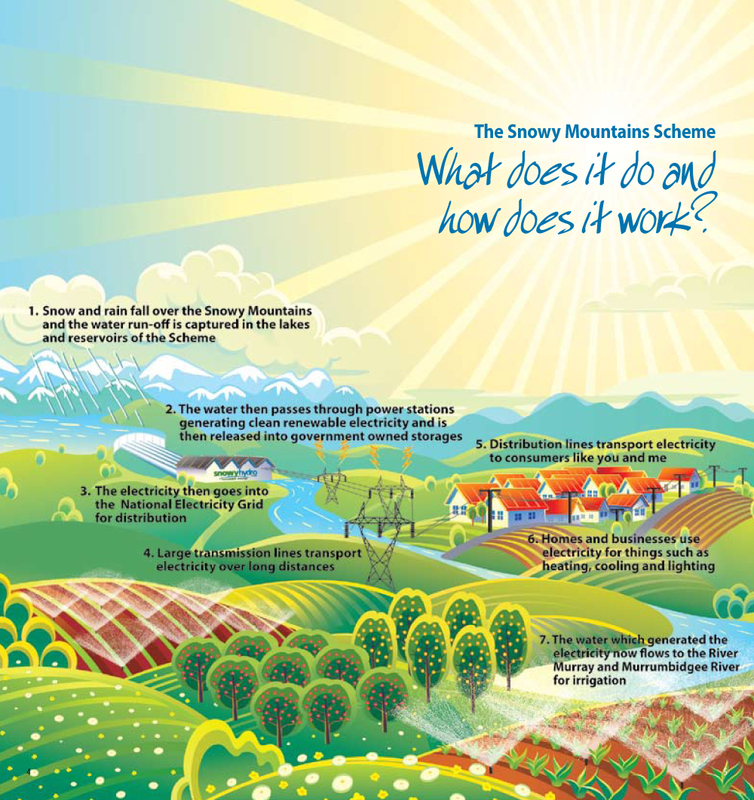 The Snowy Mountains Scheme is the largest hydro-electric scheme in Australia. It diverts the reliable waters of the south-flowing Snowy River, westwards, beneath the Great Dividing Range, and in doing so provides electric power and additional water for the Murray and Murrumbidgee Rivers to be used for irrigation. The earliest scheme for the diversion of the Snowy River waters to those of the Murrumbidgee River dates back to 1884. Proposals for electric power development followed, and in 1944 a dual-purpose scheme of power generation and irrigation emerged. 1949 saw the development of a comprehensive scheme which was approved by Commonwealth and State governments. In the same year the Snowy Mountains Hydro-electric Authority was created and work began. Dams were built, tunnels were cut through the mountains, pipelines laid and power stations constructed. The Scheme took 25 years to build and was completed in 1974. More than 100,000 people from over 30 countries came to work in the mountains to make true a vision of diverting water to farms to feed a growing nation and to build power stations to generate electricity for homes and industries. The civil engineering works were carried out by Australian and overseas companies, while the building of aqueducts, erection of transmission lines, 10 townships, 100 camps and more than 1600 km of roads and tracks, in some of Australia's roughest country, were constructed by the Authority's staff at a cost of $82 million. The scheme has two principal parts: The Snowy-Tumut Development (diverts water to the Murrumbidgee River) and the Snowy-Murray Development (diverts water from the Snowy to the Murray River). The cross section of the Snowy-Murray Development shows the passage of water westwards from Lake Eucumbene and the other smaller reservoirs, through the Murray 1 & 2 power stations and finally into the Murray River near Khancoban. The Snowy-Murray System provides an average of 570 gigalitres of water annually to the Murray via the Hume Reservoir. During dry periods the inflow to the Murray is increased to 920 gigalitres. The power generation utilises water under great pressure to spin the turbines which operate the generators. The generator is usually mounted on a vertical shaft above the turbine. The amount of power generated is conditional on the 'head' of water (distance the water falls) and the volume of water regulated through the turbine. Transformers boost generated voltage which is then transmitted over high voltage transmission lines to load centres. Hydro-power generation utilises a plentiful supply of water, it emits no pollutants and is versatile in that it can be brought 'on stream' quickly for peak-load situations. In fact the scheme is a 'peak-load' system, which supports the 'base-load' generation of the coal-fired, steam-operated systems in south-eastern Australia. It requires minimal operational staff. At Murray 1 and 2 power stations the water falls about 750 m and generates 1 500 megawatts of power in the two stations. The Snowy-Murray Development provides 980 000 megalitres of additional water annually, through the Hume Reservoir to the Murray River. Snowy Hydro Discovery Centre in Cooma, open daily except for Christmas Day and Anzac Day.